Ok, ok- not so bad! The comparisons to Disney do not end with the castle’s appearance, however, they also include the number of tour buses and crowds of sightsee-ers like ourselves! However we easily found parking (6 Euros) in the main car park and thus began our short but steep climb up to the view point for the castle. There was a bridge built above the castle called the Marianbrucke (Queen Mary Bridge) and this is the best viewpoint of the castle available to the average tourist-and is where I took the above pic. There are (at least) two trails up to the Marianbrucke and the one pictured above is a new paved trail though the forest that is a good 20-30 minute climb, but you cannot see the castle or anything along this trail. Once on the bridge you get a excellent viewpoint. However you will not be alone! We went down to the far end of the bridge which was almost empty and could take pictures without feeling like we were in a mosh pit. 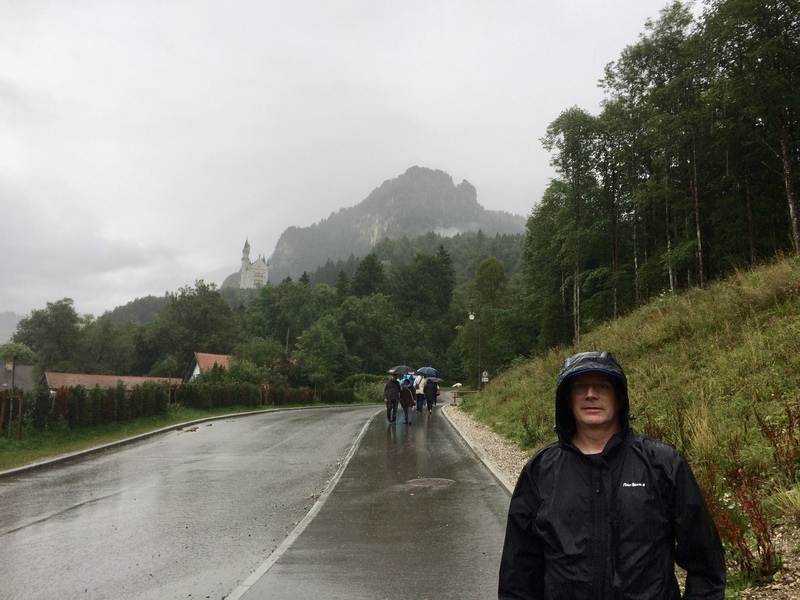 We had no interest in actually touring Neuschwanstein since the interiors of most castles tend to be quite similar and the whole point of this castle is the dramatic setting perched above the valley with the backdrop of the German Alps. (When they aren’t covered with rain clouds!! LOL!) Its also difficult to get tickets without advance planning and we had no bandwidth to deal! So we retired to our car and started off only to find some amazing views from, you know, THE ROAD! So then we got into our trusty rental bug and- zoom- off we went to Munich! Notice it stopped raining once we were no longer actually trying to see something. Travel— gotta love it!! !